Why go to the Renaissance Festival? For all the merriment and festivity! The Arizona Renaissance Festival is a medieval amusement park, a 13-stage theater, a 30-acre circus, an arts and crafts fair, a jousting tournament and a feast. Every year I go I see something new and some old favorites. 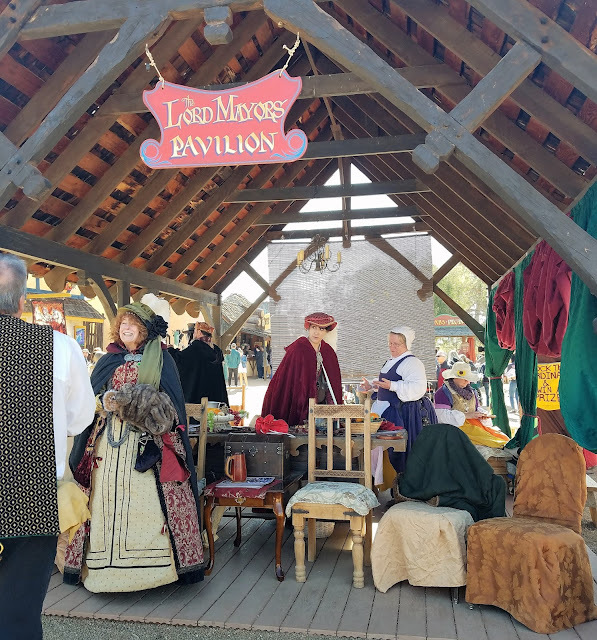 Special themed events are planned for every weekend, we recently went during the Commedia Dell’arte – Festa Italiana where you never know what amusing character could be hiding behind a mask. Go for the food, performances, and the shopping! Here His Majesty, the prince kisses my hand after reciting some flowery praise. 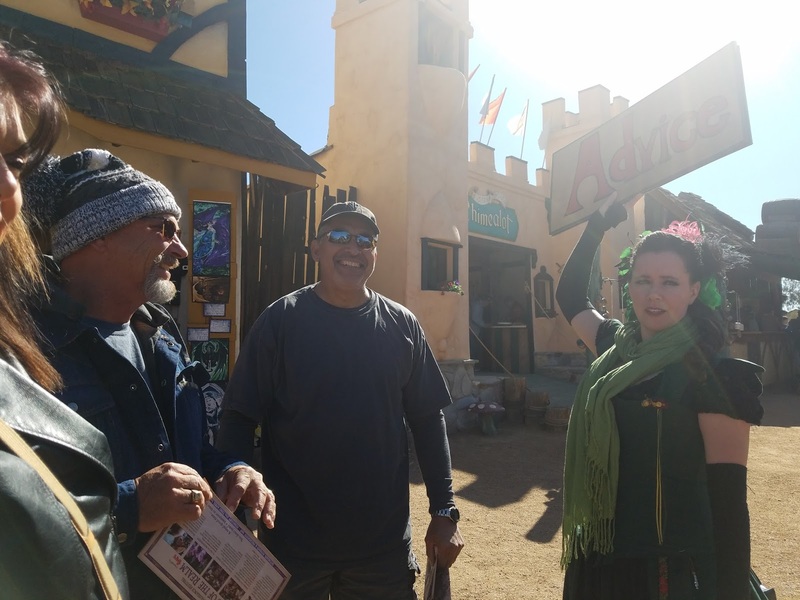 The big guys asking a fair maiden for advice. Royalty playing a game that resembles bocce ball. Turkey legs are the first thing these growing boys had to have! Lots of good food and drinks! This is my brother Mike. My brother and sister in law loving on some gentle Greyhounds. Greyhounds of Fairhaven is an all volunteer non-profit organization to promoting the adoption of retired racing greyhounds. 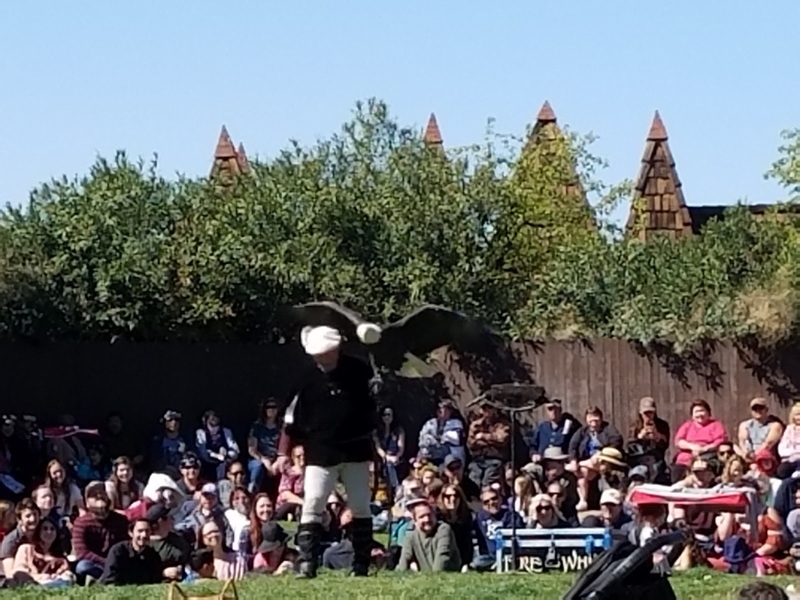 For entertainment we watched The Birds of Prey Show at Falconer's Heath, it is not only informative it is also very entertaining. 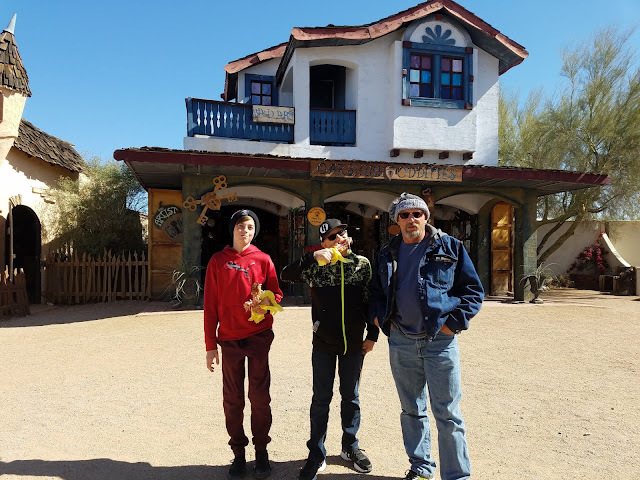 We also sat and listened to Hey Nunnie Nunnie's Mother Redempta and Sister Philomenia of the Sisterhood of the Wailing Souls who had us all laughing hysterically. 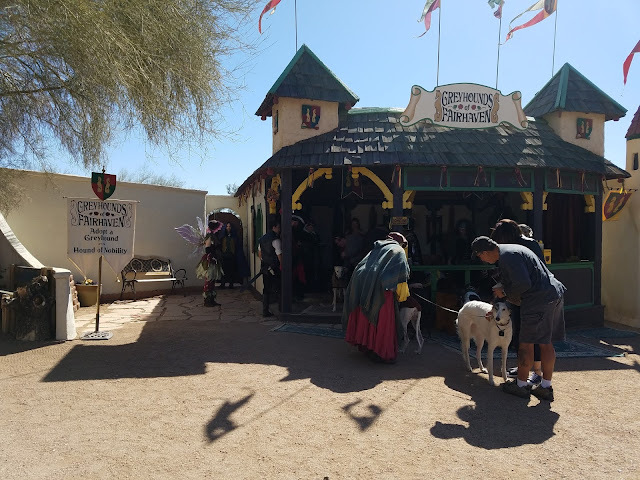 There are a lot of games and rides for everyone to enjoy. The boys gave the High Striker a try, it is a lot harder than it looks. They also did the Pirate's Assault Catapult where they were able to jump high and do flips. It was obviously fun for them since I could hear them laughing from where I was standing. Watching the Joust to the Death where armored knights compete in a jousting tournament to show their true test of skill, courage, and horsemanship was the last event we participated in. What an exciting way to end the fun filled day, cheering on our knight Sir Archer. 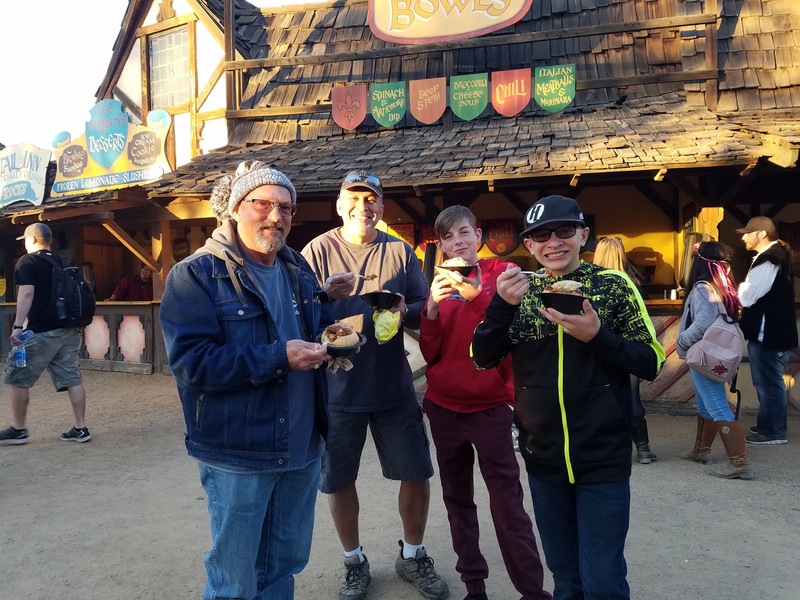 At the end of the day while on our way out of the faire the guys feasted on bread bowls while the ladies consumed a turkey leg. My sister in law getting her paper flower. 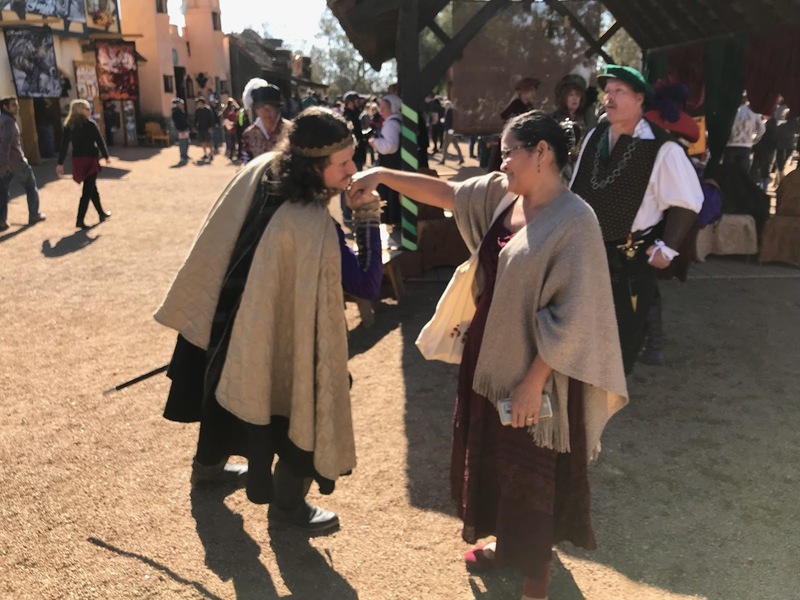 I always have a wonderful time at the RenFest and this year was no exception. It is even better going with friends and family. If you are looking for a place to take your family, plan on spending a fun filled day at Fairhaven. Kids Free! 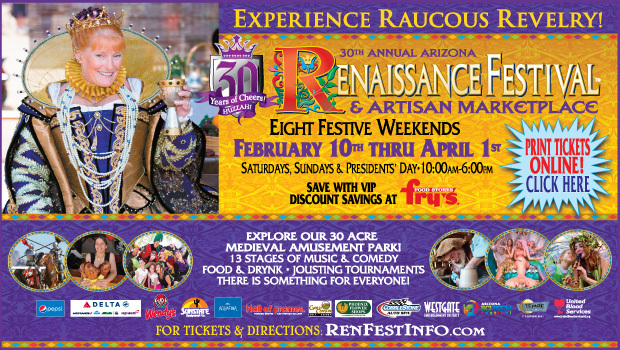 - Receive One Free Arizona Renaissance Festival Child ticket Per Coupon with One Full Price Adult Ticket Purchased at the Festival Gate.The Coupon is valid at the 2018 Festival Box Office only. NOT VALID in conjunction with a FRYS discount ticket or any other discount offer. Not for resale. One coupon per person. Distribution on Festival property is prohibited. Photocopies not permitted. $16 value. VALID FEBRUARY 24, 2018 THROUGH APRIL 1, 2018. Click here for a coupon. Contact frugalshopping1@gmail.com for questions or to have your product featured on this blog.